Our first tale has the Doctor and K-9 landing on a library world with two sides fighting over a potential ultimate weapon. However, they won’t believe that the robots who run the library world doesn’t keep information about weapons (so much for “even the most trivial items should be preserved”) so the Doctor has to trick the two sides into leaving. It’s a short but decent story. The second story is a little less traditional but easier to tell in comics form than the budget the BBC gave the show at that time. The Doctor comes upon a newly landed survey team, whose commander is eager to finish this last run and go home, and overeager to what he thinks is protecting the people from a giant legion of spiders but turns out to actually be important to their way of life. I don’t know. It didn’t really work for me. I like the concept but I keep having this nagging feeling that Moore is trying to comment on something beyond the “don’t judge a book….” thing. That could just be me though, and not an actual intention, but something about this presentation nags me for some reason. The message itself is fine though. Back with Abslom Daak and Salander, the latter does have a ship they can escape on but Daak won’t leave without Taiyin and Salander won’t risk his family being dishonored…until his son listens to the Emperor when he orders not to attack a Dalek ship that destroyed a Draconian scout ship that got too close to Dalek-controlled space. Salander disowns his son and, unaware that the Emperor has dismissed the impeachment and wants to simply inspect the space yacht, Daak and Salander reclaim Daak’s ship and together with the cruiser Salander has the prototype for they make their escape, Salander forced to kill his son (which he is sure is caused by his political rivals). Now the duo and the still frozen Taiyin make their way their way to recruit a full compliment for the ship. This is still a good storyline, and there will be more next issue. Overall this was a good comic. The two Doctor tales are good, despite my naggings about the second, and Abslom’s tale continues to entertain. Worth checking out. 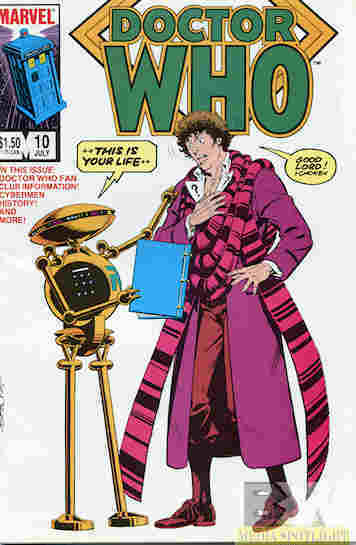 Posted by ShadowWing Tronix on November 7, 2018 in Television Spotlight, Yesterday's Comics and tagged Abslom Daak, K-9, Salander, The Fourth Doctor. Don’t overthink the second story. Even there is a slightly hidden agenda, enjoy it as long as the story is entertaining to read and view. Every artist and writer always has some type of subtle agenda to their work, even if they’re not conciously and purposely doing it. That’s because everything we do is influenced by what happened to us in the past and also our perspectives on the world and life. I don’t think it’s so much that there is an alternate moral and more I don’t know what it is but it feels like it’s there. That’s what’s distracting me. I did like it though. You probably wish you could identify exactly what Moore’s alternate moral is there in the story. You know it’s there, but you just can’t quite pinpoint it. If Moore is still alive, you could always e-mail him and ask.